It is such a blessing to capture babies at their earliest stage of life and give families a way to treasure those precious memories for a lifetime. Newborns are my specialty, and I strive to make sure I capture every small detail on your little one. From their pouty lips to their peely toes, I am here to make sure you never forget just how new & fresh your sweet baby is! Your newborn session will take place at my Ridgefield studio when your baby is 6-14 days old. For newborn sessions, a sleeping baby is the best way to capture every detail. Sessions include a variety of posed & unposed newborn setups, as well as family/sibling photos if desired. Most newborn sessions are booked about 2-6 months in advance, but occasionally I can take on a last minute session. If you can, contact me during the 2nd or 3rd trimester to secure your session! 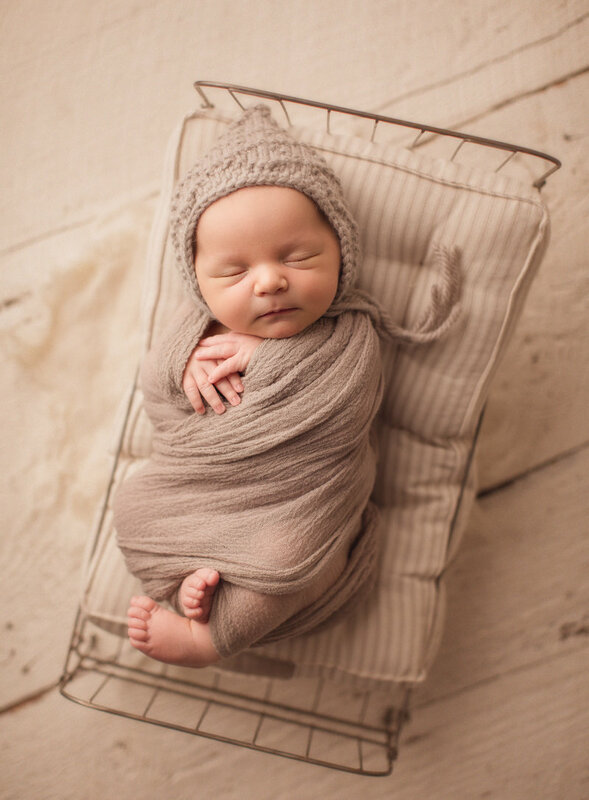 The studio is very warm for newborn sessions, which helps the baby stay comfortable throughout the photo shoot. Newborn sessions usually last about 3 hours but is dependent on the baby's temperament and whether or not family/sibling photos are desired. The studio is stocked with all the props & accessories your baby needs for his/her photo shoot! I will ask you ahead of time your color/style preferences, then have everything all set up upon your arrival for an easy, smooth session. I have an amazing assistant, Alicia, who joins me for newborn sessions to ensure your baby always has two sets of hands keeping him/her safe during posing. Alicia has 5 children of her own so she is the best with babies! Want to add a Sitter Session to your collection? Book it together with your newborn session for an additional $325. That's $50 off the normal price of a sitter session! Sitter sessions take place between 6-12 months old. Click HERE for information about Sitter Sessions. Want to bring the whole family for photos with your precious one? No problem, this collection is for you! Only want photos of your sweet, little one? This collection is for you! Before you decide what to wear, you will need to consider the different options I have available for families in my studio. The first option I have for families are posed shots, where baby is carefully posed into your arms with a simple, solid backdrop. These work great for parents with only baby (no siblings). I suggest mom wear a neutral tank top and comfy pants, while dad can wear a neutral t-shirt (or go shirtless). Another option is a lifestyle look, using my sofa or bed as a prop for your family to take photos on. These tend to work better for larger families or for parents who enjoy this style of photography. For these photos, more clothing tends to show, so I like to have families wear a more styled look. Moms looks great in a cream, flowy dress, while dads can wear nice jeans & a t-shirt or simple button-down. Check out some inspiration HERE. I am gradually adding children's clothing to my studio for families who want to use them during their sessions. If you are interested in seeing what I have available, please let me know your child/children's size, and I can show you what I have available! + Dress cool and comfortably! The studio will be very warm at 80 degrees to keep your naked baby happy! How should we prepare for our newborn session? Yes, there is a $250 required deposit at the time of booking. The remaining amount is due on or by the session date. Your deposit ensures a session 6-14 days after delivery. Do you require a deposit at the time of booking? Great question! I don't book the official session date until your baby has been born. When you book your session, I will write your due date on my calendar to ensure space for your session, then I ask that you contact me within 48 hours after delivery to schedule. I only book a couple sessions per week to keep my schedule flexible for families. Sessions generally are booked M-F and begin late morning. How do I book a newborn session date when I don't know what day my baby will arrive? "I waited a long time to have a baby, and had been following Whitney's Instagram for years. When my son came I was beyond impressed with her patience, professionalism, and calm demeanor. She has the experience and attention to detail we were looking for! I cannot recommend her enough and look forward to future sessions as my family grows." "Working with Whitney was such a great experience! She had a very proficient assistant helping with our twins’s session and a very comfortable area for me to watch the action. We will treasure these special memories forever! I highly recommend Whitney Summers Photography to anyone who is looking to have photos taken."